This thesis describes methodological and empirical studies of genetic risk prediction of common diseases. 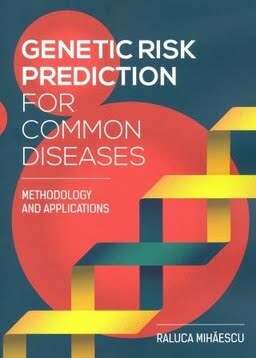 The methodological studies involved the evaluation of traditional and new methods of model performance, the evaluation of rare variants for risk prediction of common diseases, the assessment of simulations strategies for replication of empirical data, and the evaluation of reporting in empirical risk prediction studies. The empirical studies involved the evaluation of direct-to-consumer (DTC) genetic tests, the external validation of genetic risk prediction models across European samples, and the evaluation of differences in prediction performance in published genetic risk prediction models. Both simulated and empirical data were used to conduct these studies. By means of simulation, a population distribution of genetic variants was created starting from the effect size and frequency of individual variants and assuming that genetic variants are inherited independently and that their joint effects follow a multiplicative risk model. The empirical data came from the Rotterdam study, a prospective, population-based, cohort study among 7,983 inhabitants of a Rotterdam suburb, designed to investigate determinants of chronic diseases; and from a community-based cohort i.e., the combination of Atherosclerosis Risk in Communities Study, Cardiovascular Health Study and Framingham Heart Study. Sponsor The work described in this thesis was conducted at the Department of Epidemiology of the Erasmus MC, Rotterdam, the Netherlands. The studies presented in this thesis were funded by a VIDI grant of the Netherlands Organisation for Scientific Research (NWO) and by a grant from the Centre for Medical Systems Biology (CMSB) in the framework of the Netherlands Genomics Initiative (NGI). The Rotterdam Study is supported by the Erasmus Medical Center and Erasmus University Rotterdam; the Netherlands Organisation for Scientific Research (NWO), the Netherlands Organization for Health Research and Development (ZonMw), the Research Institute for Diseases in the Elderly (RIDE), the Netherlands Heart Foundation, the Ministry of Education, Culture and Science, the Ministry of Health, Welfare and Sports, the European Commission (DG XII) and the Municipality of Rotterdam. The GWAS database of the Rotterdam Study was funded through the Netherlands Organisation of Scientific Research NWO (grant numbers 175.010.2005.011, 911.03.012) and the Research Institute of Diseases in the Elderly (RIDE). Financial support for the publication of this thesis was kindly provided by the Department of Epidemiology of the Erasmus Medical Center and the Erasmus University Rotterdam.